At the BoatUS Foundation, this subject is always a “hot topic,” especially because some boaters mistakenly believe that fire extinguishers must be mounted. US Coast Guard Fire Extinguisher requirements include the following: Must be a marine-type, US Coast Guard-approved, in good, serviceable condition with sufficient charge, and you must have the required number of extinguishers aboard for your size and type of vessel. While mounting an extinguisher is not a USCG requirement, doing so is a smart idea because it keeps the extinguisher accessible where anyone can quickly grab it in the event of a fire. 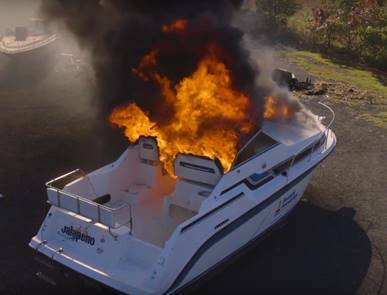 Coming Soon: In April 2017, we’ll be releasing a full-length BoatUS Foundation Boat Fire Safety video that captures three dramatic fires on different types of powerboats. The video will urge boaters to improve their fire-safety efforts. This short one-minute+ burning boats reel captures some of the action. Here’s to a safe and early start to the boating season!